The OU Club of Colorado raises and gives out over $12,000 in partial scholarships each year to young adults from Colorado and Wyoming that are attending the University of Oklahoma, and we couldn’t do it with out the help of our fine sponsors! We thank them, and we ask that you support those that support us! Stoney’s has newly renovated and expanded. Stoney’s seats almost 800 people now! You can find all your Sooner sports on the TV’s at Stoney’s. The OU Club of Colorado hosts watch parties for each and every OU football game, including the pay-per-view games, but Stoney’s also carries all the OU Basketball and Baseball games and if they don’t have the game on, just ask ’em! Stoney’s Bar and Grill is also proud to be a Green Certified business from the City of Denver! Stoney’s is located at 1111 Lincoln, Denver, CO 80203 in the Capital Hill area of Denver. Born high in the Rocky Mountains of Colorado, nothing is as local as cold Coors and Coors Light. It’s great to get a local icon of beers as the beer sponsor for the OU Club of Colorado. At all the OU Club of Colorado Watch Parties you can enjoy crisp, clear, cool Coors and Coors Light draft pints for only $4.00. We also feature a couple of great imported beers from Modelo Especial and Pacifico Cerveza pints for $4.50. Remember with your paid OU Club Memberships, you can get these Saturday Game Day specials EVERYDAY at Stoney’s Bar and Grill. 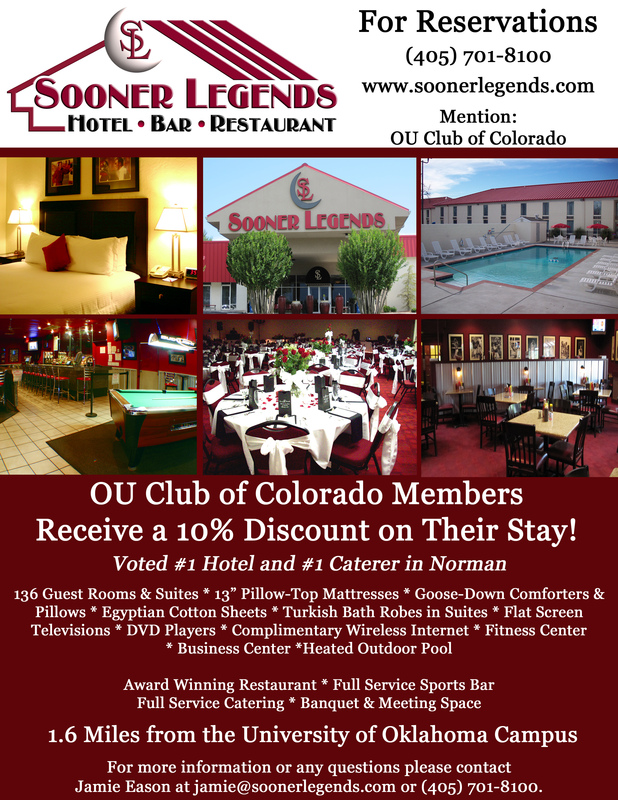 With your OU Club of Colorado you get 10% off your stay at Sooner Legends Hotel and Restaurant in Norman, Oklahoma! Sooner Legends Inn and Suites, is a family-owned and operated full service Oklahoma Sooner sports-themed hotel in Norman, Oklahoma, at I-35 and Lindsey, just 1 1/2 miles from The University of Oklahoma. The hotel features 136 upscale rooms, including 16 suites. Each room features pictures and stories of Former Legendary Sooners and is a themed room like the Waymon Tisdale room, or the Prentice Gauttt room. With over 2000 pieces of Sooner memorabilia, Sports fans will love the decor! Each room is full of luxury too, featuring 13″ pillow-top mattresses with Egyptian cotton sheets and goose-down comforters and pillows and 32″ flat screen televisions. Sooner Spectator Magazine is an award winning magazine that brings you the best of Sooner News of any magazine on the stands. They have regular issues during the football season and they have several special issues that preview football, basketball, and the spring sports. Sooner Spectator is a must have to keep up with the Sooners when you live away from Oklahoma. With your OU Club of Colorado Membership you can get a full $10.00 off your paid yearly subscription. 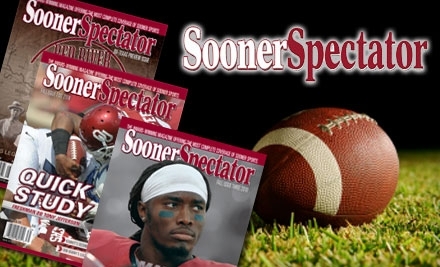 For only $29.95 you get every issue of Sooner Spectator Magazine, normally $39.95 this offer is only available through the OU Club of Colorado membership. Call (405) 364-4515 and ask for Jay Upchurch to subscribe and make sure you mention your OU Club of Colorado membership discounted subscription rate. Thank you to all of the great sponsors of the OU Club of Colorado! !